On November 18th, 2015 we achieved our goal and became designated as a HEARTsafe community! Click here to see our latest exploits in HEARTsafe and see how we are making a difference! Firefighter Troy Lachinski is leading the East Bethel community in its efforts to grow and maintain its designation as a HEARTsafe community. The benefits of being a HEARTsafe community includes a reduction in response time when identifying a sudden cardiac arrest, knowing what to do, where to find an AED, completing hands-only CPR and ultimately saving lives. Trained a percentage of the public to use AEDs and hands-only CPR. The East Bethel HEARTsafe program is led by East Bethel's Fire Department, headed by firefighter Troy Lachinski. They will continue to recruit volunteers, hold training sessions on CPR and AED usage, identify locations of AEDs, and acquire more AEDs in public spaces. There are grants available for AEDs. Contact Heart Safe East Bethel to find out more. The devices cost anywhere between $1,100 and $2,000 and are invaluable tools when someone is suffering a sudden cardiac arrest. 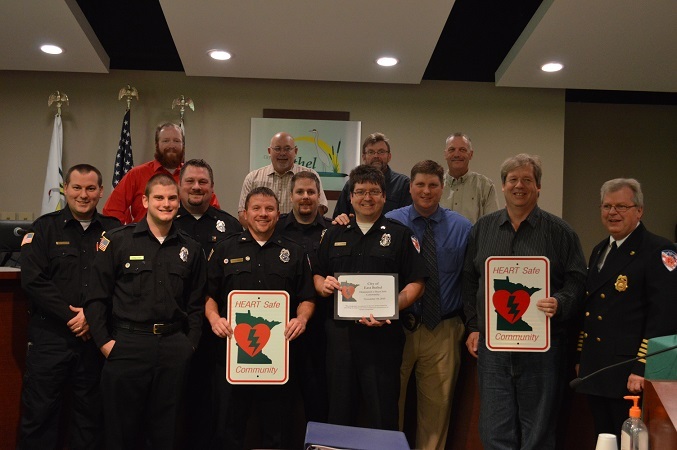 Minnesota has 34 cities that are certified as a HEARTsafe community (updated February 2015), meaning they have completed trainings and have made AEDs accessible to the community. East Bethel has become one of these communities by empowering bystanders to act quickly during those first, crucial minutes a patient is affected. Trainings are free of charge and held at various locations in East Bethel. The training provided will be "Bystander CPR" which is compression only CPR and does not include giving breaths. Training also includes hands on training and understanding of Automatic External Defibrillators (AEDs). This is not a certification but rather life training that never expires. If you would like to schedule a training session at your East Bethel business, please contact Heart Safe East Bethel. AED's have several different appearances, but they all work the same general way. They are designed to be easily used during a time of panic. The directions are printed on the device and tell you how and where to apply the pads and how to proceed. The Minnesota AED Registry is a free AED maintenance tool that allows AED owners free online management of AEDs, AED battery and electrode expiration email reminders, notifications from manufacturer or government agencies and the ability to participate in the AED link system where available. Here are directions on how to register your AED. For more information, here is Allina's Guide to maintenance, registration and more! According to the Minnesota Department of Health, sudden cardiac arrest is the second-leading cause of death in Minnesota, responsible for almost 20% of deaths. It can happen to anyone, anywhere, and almost always it’s fatal. The HEARTsafe Communities initiative is working to change those statistics. Cardiac arrest is triggered by an electrical malfunction in the heart that causes an irregular heartbeat (arrhythmia). With its pumping action disrupted, the heart cannot pump blood to the brain, lungs and other organs. What Happens: Seconds later, a person becomes unresponsive, is not breathing or is only gasping. Death occurs within minutes if the victim does not receive treatment. What to do: Cardiac arrest can be reversible in some victims if it’s treated within a few minutes. First, call 9-1-1 and start CPR right away. Then, if an Automated External Defibrillator (AED) is available, use it as soon as possible. If two people are available to help, one should begin CPR immediately while the other calls 9-1-1 and finds the AED. Even if you're not sure if the symptoms are a heart attack. 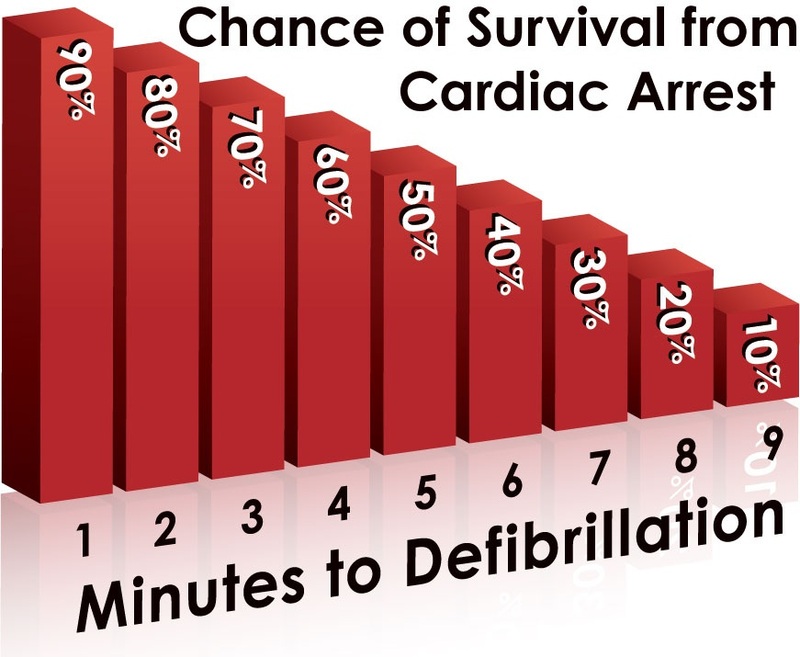 An AED can measure heart beats and notify you if the shock is needed or not. And call 911 immediately! If you would like to get involved, please contact Troy Lachinski with the Heart Safe East Bethel Program, or call him at (763) 350-9060. Free training open to the public! or call to schedule a training for your group!